The promise of blended learning rests primarily in its alleged ability to provide better learning outcomes than either face-to-face or eLearning can deliver on their own. But it begs the question of return on investment (ROI), which will inevitably come up somewhere along the line if blended learning is pursued in a substantial way. Having at some point finally convinced the c-suite that making the shift from face-to-face to eLearning was the right thing to do if for no other reason than it would save a ton of money, learning professionals are now saying they need to keep or bring back some amount of face-to-face learning in order to enjoy the benefits of blended learning. The reaction from the c-suite is likely to be a rolling of the eyes, and then a pointed question about ROI. One industry that has begun tackling this issue head-on might seem an unlikely model for the rest of corporate America – the corrections industry. The use of blended learning in corrections tends to favor using online delivery for the knowledge base, and then classroom training for hands-on and practical skills. The case for blended learning made headway thanks initially to the cost-savings aspect, but now administrators want to know more about the impacts in terms of compliance, time, and employee satisfaction. Ask our corporate development experts. One such curriculum for blended learning was created by the American Correctional Association (ACA) in conjunction with an LMS created by Relias Learning. The results after implementing it at one correctional agency were impressive: Regarding time and cost savings, the time spent on reporting and tracking was reduced by 75%; the time spent on creating courses was reduced by 65%; and the reduction in overtime due to training was reduced by 50%. In terms of compliance, deficiencies were reduced by 90% and liability risk went down by 35%. And because part of the appeal of blended learning is immediate application on-the-job as part of the learning process, time spend off the job for learning was reduced by 60%. American Correctional Association (ACA) for recertification of various ACA certification programs. Selected courses have been cross-walked to various ACA standards. American Jail Association (AJA) for the AJA’s certified jail officer (CJO) and certified jail manager (CJM) certification programs and can be used for both initial certification and recertification. American Probation and Parole Association (APPA) for continuing professional education. OSS Academy (OSS) approved by many state Peace Officer Standards and Training boards to provide law enforcement continuing education for law enforcement personnel. But the ACA/Relias offerings aren’t the only game in town. The National Institute of Corrections has created Captains’ Leadership Curriculum. Originally developed and delivered to 99 captains at federal prisons, the course is now widely available to captains at state prisons and local jails everywhere. Its particular take on blended learning mixes virtual instructor-led training with online courses and video conferencing. This is a particularly important effort because leadership training is one of the best places to apply blended learning since it’s all about far-transfer skills, meaning the learning is applied in ever-changing circumstances, as opposed to near-transfer skills that are about exercising procedural tasks that don’t change. Transfer of training into the workplace is facilitated through the curriculum’s Action Learning Plan, a structured process for applying learning on-the-job and reporting back about how it went. 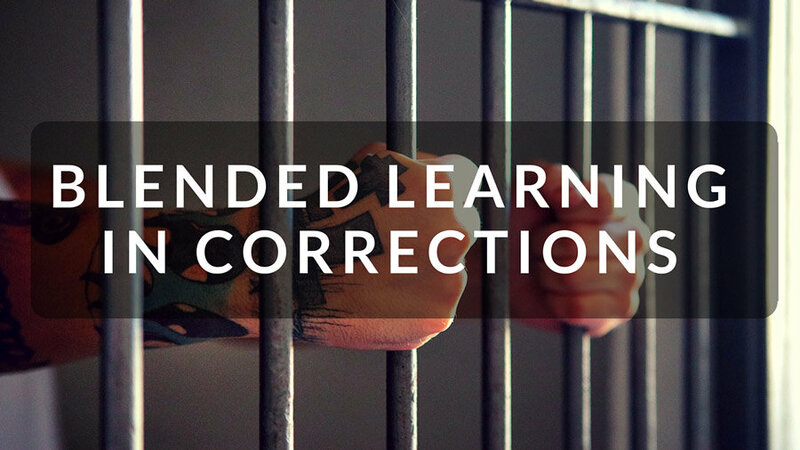 When an industry as reliant upon face-to-face training as corrections begins to show how blended learning works even there, it’s only a matter of time until it becomes the routine approach for most of corporate learning and development efforts.